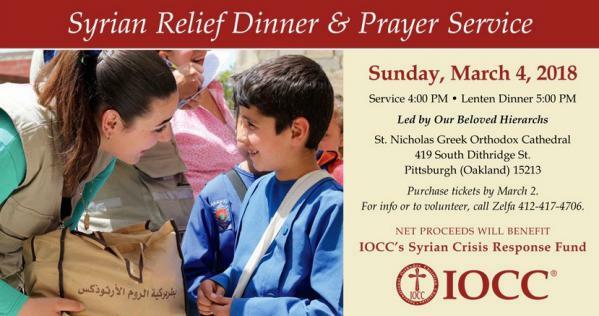 Sunday, March 4, 2018, a prayer service and dinner for Syria will be held in Pittsburgh, PA, with proceeds benefitting the IOCC's Syrian Crisis Response Fund. His Eminence Metropolitan JOSEPH, as well as His Grace Bishop THOMAS, will join other hierarchs and clergy for the event. The prayer service will be at 4:00 p.m., followed by the dinner at 5:00, at Saint Nicholas Greek Orthodox Cathedral on 419 South Dithridge Street (Oakland), Pittsburgh, PA, 15213. For reservations contact Zelfa Khalil: 412-417-4706 or zkhalil1@live.com. Visit the event page for reservations and sponsorship information. I greet you on the solemn and joyous feast of the Meeting of Our Lord God and Savior Jesus Christ! Today, the Lord Christ is brought up to the Temple in obedience to the law of God. As Saint Gregory Palamas notes, "Notice that the Creator and Lord of the law is completely obedient to the law. What does He achieve by this? He makes our nature obedient in all things to the Father, He completely heals us of its disobedience, and transforms the curse on it into a blessing." The Lord Christ assumes our human nature in order to heal and redeem it. 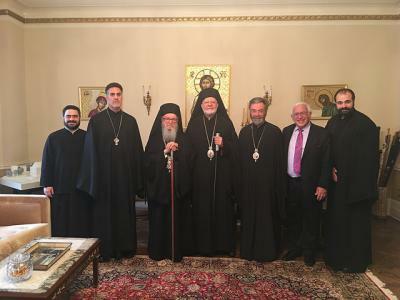 Rekindling their friendship, His Eminence Metropolitan JOSEPH paid a visit to His Eminence Archbishop DEMETRIOS, Geron of the Greek Orthodox Archdiocese of America, at his Manhattan headquarters. The two primates discussed issues of mutual importance to their respective flocks in a filial meeting on Tuesday, January 23, 2018. Metropolitan JOSEPH was grateful to Archbishop DEMETRIOS for his hospitality. Afterward, Archbishop DEMETRIOS hosted lunch for Metropolitan JOSEPH and his delegation: Archpriest Thomas Zain, Vicar General of the Antiochian Archdiocese; Deacon John El-Massih, assistant to Sayidna JOSEPH; and Mr. Charles Ajalat, former Archdiocesan chancellor. 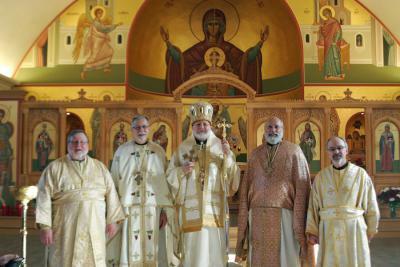 Joining them from the Greek Archdiocese were His Grace Bishop SEVASTIANOS and Archimandrite Nathanael Symeonides. We have previously shared the lovely board book What Do You See at Liturgy? by Kristina Kallas-Tartara. 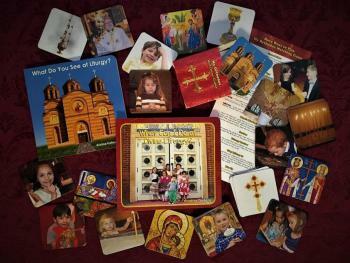 As we mentioned in that blog post, the book consists of a gentle rhyme paired with pictures of what a child will see when they go to the Divine Liturgy. We continue to recommend this book as a helpful tool to help little ones enter into the service when their attention needs to be redirected. Memory Eternal! Subdeacon Joseph Louis Vacca was born in Arlington, VA, on June 10, 1948, the only child of Gene A. and Nan Vacca. He graduated from Catholic University in Washington DC and joined the Benedictine Monastery of St. Anselm in Manchester, NH. In 1976 he gradated from Creighton Law School, then joined the Army as a lieutenant commanding the 2nd platoon 759 MP battalion at Ft. Dix, NJ. Joe married Mary Lee Koops on April 1, 1977. He returned to Omaha in 1979 and was admitted to the bar. He worked as an attorney in Omaha for many years. He retired in 2002 to devote himself full time to his great loves: model railroading, spiritual reading and writing, and his parish, St. Vincent of Lerins. He entered into peaceful rest on January 21, 2018, after many illnesses that deprived him of the life he wished to lead. His vast knowledge, unfailing wit and courage in the face of adversity will be greatly missed by his family and many friends. He is survived by his wife of 40 years, Mary Lee; and his loving son, James, of whom he was justly proud; and his son-in-law, Chris Sutton. He is preceded in death by his parents, Gene and Nan Vacca. Wednesday, 5-6:30pm with Memorial Vespers at 6:30pm at St. Vincent of Lerins Western Orthodox Church. Thursday, 10am, at St. Vincent of Lerins Western Orthodox Church, 2502 N 51st Street. Interment: Forest Lawn Cemetery. Memorials to the Nebraska Humane Society. The annual diocesan clergy meeting for the Diocese of New York and Washington, D.C. was held at the headquarters of the Antiochian Archdiocese in Englewood, New Jersey on January 16, 2018. His Eminence Metropolitan JOSEPH presided over the meeting, which was also attended by His Grace Bishop JOHN, and many clergy from the Diocese, both priests and deacons. Archimandrite Fadi Rabbat from Mexico City was also in attendance. In the meeting, the attendees decided on a patron saint, forming The Brotherhood of Saint John of Damascus. The Very Reverend Thomas Zain, Archdiocese Vicar General and Dean of St. Nicholas Cathedral in Brooklyn, New York, was appointed as the dean of The Brotherhood. The meeting commenced with prayer and the reading of the Epistle and Gospel. 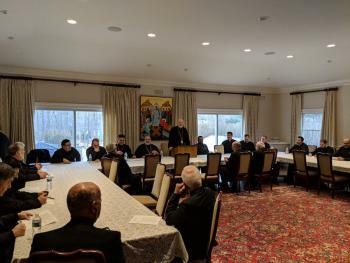 Metropolitan JOSEPH and the clergy then discussed various topics including liturgical practices, the education of priests, and dealing with both parish and external organizations, including government entities. The underlying themes of pastoral care and the dignity of the priesthood informed the entire discussion. The meeting adjourned around 1:00 p.m., and was followed by a lunch hosted by His Eminence. The Very Rev. Dr. Joseph Purpura, chairman of the Department of Youth and Parish Ministries, encourages all youth workers to attend the upcoming Youth Worker Workshop. This year's Workshop is being held in Atlanta, Georgia from February 1 – 3, 2018, and is themed "The Place of Gratitude in Youth Ministry." An enriching and uplifting experience, the Workshop connects youth and camp workers from all jurisdictions, providing them with inspirational and challenging ideas to help them in their ministries. More information, video of presentations from past years, and registration and hotel details, are available on the Workshop website. With the blessing of Metropolitan Joseph, NAC SOYO announces that the application for the 2018 SOYO Metropolitan Philip Youth Worker Scholarship is now available. The following are the requirements that must be met in order to be eligible for the Youth Worker Scholarship. The applicant agrees to enroll in a recognized Orthodox Christian program with a youth ministry focus or component. The recipient will seek direction from the Chairman of the Archdiocese Department of Youth as to which institution is available for training. The applicant is willing to make a minimum three year commitment to parish youth work in the Antiochian Archdiocese either as a volunteer or on a paid basis, but only following completion of the program [EC1] . In a spirit of joy and commemoration, His Eminence Metropolitan JOSEPH celebrated the Feast of Theophany and the 25th Anniversary of St. John Chrysostom Antiochian Orthodox Church in York, PA on the weekend of January 5–7, 2018. His Eminence worshipped with the faithful of St. John on Friday evening, and presided over Hierarchical Divine Liturgies on Saturday for the Great Blessing of Water and on Sunday morning. His Eminence was joined by His Grace Bishop THOMAS, Diocese of Oakland, Charleston, and the Mid-Atlantic, who celebrated with the community as well. Father Peter Pier is the founding pastor of the congregation. In April of 1995, 13.8 acres of land was purchased for St. John's future home, and in the spring of 1997, His Grace Bishop ANTOUN of Blessed Memory broke ground for construction. We are pleased to announce that applications are being accepted for the 2018 Eastern Dioceses Scholarships. This year, up to 3 awards are available in amounts ranging from $1000 to $2,000. Included with this cover letter, please find a copy of the 2018 Scholarship Application for you to share with graduating high school seniors from your parish. The form may be copied should you have additional applicants. Your cooperation in sharing this information is so very important in spreading the word about the availability of these scholarship opportunities. Thank you for your cooperation and support. Please do not hesitate to contact me with any and all questions! 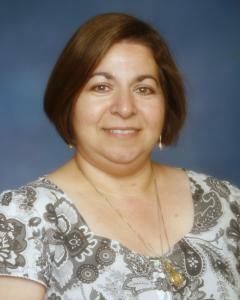 Laila Ferris has devoted 25 years and counting to serving as church school director at St. George Antiochian Orthodox Church, El Paso, Texas. Presently, there are 37 students enrolled and classes are organized by groups of two grade levels, plus grades 8-12 together as one class. Which curricula do you use for Sunday classes? We use a combination of curricula/materials from the OCEC and from the Greek Orthodox Archdiocese to support our students’ learning. We also use online lessons provided by our Archdiocese Department of Christian Education. The teachers develop lesson plans that use active and engaging learning activities through which the lessons are taught and learned. We are presently working towards developing more opportunities for learning activities via apps and web-based programs for our students (as the digital generation) to expand their learning experiences. Our plan is to be able to purchase iPads for use in the classrooms to support digital projects. But in the meantime, the church school staff will continue to use their personal devices to grow our instructional lessons digitally. Theophany has already passed for those of us following the new calendar. The waters have been blessed. Our souls have been cleansed and refreshed by the drinking/sprinkling thereof. So now it’s time to help our Sunday Church School students learn about house blessings to ensure that they are prepared when the priest arrives to bless their home. We should teach our students that the house blessing has been part of Orthodox Christian practice for centuries. They should also learn that although the house blessing is not a sacrament, it is an important part of helping Orthodox Christians to live the Faith at home. We also should teach our students (or at least refresh their memory) about the house blessing service itself: First, we can teach them about the service – the order of service, the prayers, and the hymn. Talk together with your class about the prayers, which request God’s sanctification of the home, and what they mean. Together sing the troparion to remind the students of how it goes; and then discuss the words in the troparion. Consider how special it is that they will have time to spend with the parish priest. Remind them that every member of the family can participate in and help with the house blessing, and that the entire family will benefit from the house blessing. Note: This series of blog posts will focus on principles important to Orthodox Christians who are raising children. The series will feature a closer look at Dr. Philip Mamalakis’ book, Parenting Toward the Kingdom: Orthodox Christian Principles of Child Rearing. Each week we will take a closer look at one section of the book, which is divided into 6 basic principles of child rearing. Find an overview blog post about the book here. We thank Dr. Mamalakis and Ancient Faith Publishing for giving us permission to share his wisdom with you in this way. Purchase your own copy of his book here. Dr. Philip Mamalakis’ book Parenting Toward the Kingdom is filled with wisdom and encourages godly parenting. 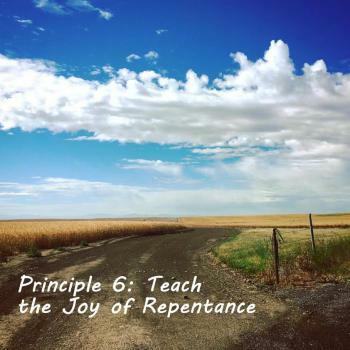 The sixth and final principle, “Teach the joy of repentance,” is yet another challenge towards godliness, and is as invaluable to the souls of the parents who follow it as it is to those of their children. He begins with a chapter on repentance, then discusses the joy of repentance, and closes with the encouragement that Orthodox Christian homes nurture repentance and confession. The chapter on repentance begins by encouraging parents not to focus on “doing” parenting, but rather to focus on loving God while responding to our children. He emphasizes that only a saint would parent perfectly, and that we should not expect ourselves to be able to do so. Rather, we should expect ourselves to learn and grow, just as we expect our children to learn and grow. The Holy Spirit will raise in us the fruits necessary to be the parents we must be. If we want to best reach our long-term parenting goals, we need to labor to acquire the Holy Spirit. As we work towards living a Godly life, it is important that we not cover over our mistakes; but rather that we use those mistakes to teach our children the joy that is found in repentance. Since repentance is at the heart of our Christian life, it follows that teaching repentance should be at the heart of our parenting. 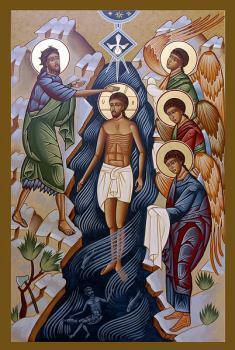 I greet you on the solemn and joyous feast of the Holy Theophany of Our Lord God and Savior Jesus Christ! 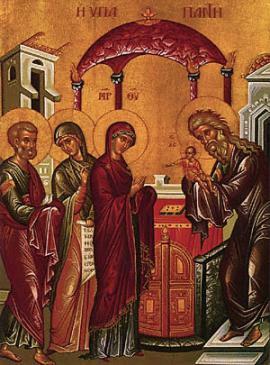 As the Nativity revealed Almighty God’s condescension and humility in becoming incarnate, so the Theophany reveals the glory and power of the triune God. enfleshed with His flesh, and is the Child and Immanuel. As we contemplate His Baptism, let us remind ourselves the "Spirit of the Lord" - His Spirit - was present at His Annunciation and Nativity, even Pentecost. This same One Spirit of Jesus is Holy and expressed through Moses and His Prophets, throughout the OSB-Septuagint Old Testament. On January 6, 2018, the Boston Byzantine Choir under the direction of Charles R. Marge will present "The Twelve Days of Christmas." The concert will be held at St. Mary's Orthodox Church in Cambridge, Massachusetts and will be livestreamed here at 6 pm Eastern Standard Time. In this program, the Choir will take us on a journey of sacred chant through the twelve days of Christmas starting with the Nativity and ending with Epiphany. 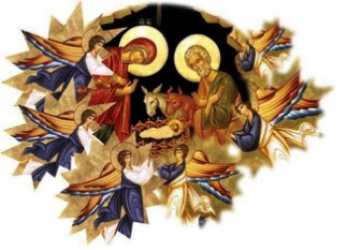 Each day from December 25 through January 6 brings its own hymnography rich in the theology of the season, beautifully expressed through the Byzantine musical tradition. For the past 25 years, the Boston Byzantine Choir has endeavored to make Byzantine chant and the Orthodox Christian faith accessible to the English-speaking world. The choir grew out of the chanting tradition of St. Mary's in Cambridge, and has chanted at services and performed in concerts and festivals in New England, the Mid-Atlantic, Montreal and California. The Boston Byzantine Choir is best known for its five recordings of Byzantine Chant in English: First Fruits, Mystical Supper, Thy Passion, Thy Resurrection, and Lenten Journey. This program, which includes the New England premiere of new Byzantine chant compositions in English by Dr. Jessica Suchy-Pilalis, will form the basis for a sixth recording entitled Twelve Days, to be released later in 2018. From Friday, October 20, to Sunday, October 22, 2017, the annual retreat of the deacons of the Diocese of Charleston, Oakland, and the Mid Atlantic took place. 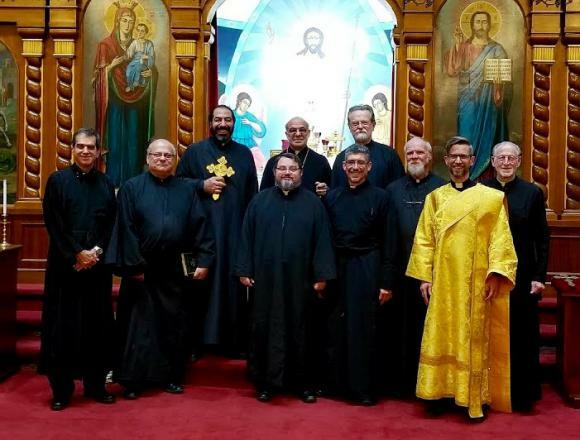 This year we were hosted by the parish of St. George Orthodox Cathedral in Charleston, West Virginia and their priest, Fr. Christopher Eid. In attendance were Sayedna Thomas, Fr. Anthony Roeber (the chaplain to our deacons), and seven deacons. This year our retreat was pan Orthodox, as Deacon Wayne Paul Wright of the Romanian Orthodox Church of Fairlawn, Ohio heard about our retreat, and he asked Sayedna Thomas if he could attend. Sayedna Thomas enthusiastically invited him, and Deacon Wright’s participation was most welcome and instructive. Sylvia Jean Joseph, mother of His Grace Bishop THOMAS, reposed in the Lord on Christmas Eve, 2017. She was 93 years old. 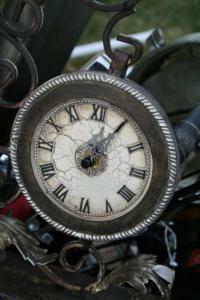 Writes His Grace, "As you know, she had been suffering for a good period of time. Although this was unexpected, she was visited by both a deacon and priest today....There are so many of you who prayed for my mom and offered all kinds of support. My father, my sister and I are eternally grateful to you. More importantly, Mom is grateful. I'll ask again for your holy prayers for her soul. May she rest in peace, and may God give us the strength to bear this loss." On Friday, December 29, 2017, there will be a viewing from 2-4pm at Holy Cross Orthodox Church, 2365 South South Olga Drive in Ft. Myers, FL 33905. Included in this will be a Trisagion service at 3:30pm. Today doth Bethlehem receive Him Who sitteth with the Father forever. Today the angels glorify, as worthy of God, the babe that is born, shouting: Glory to God in the highest, and on earth be peace, and goodwill among men. With great joy I greet you at the dawn of this bright and glorious feast of the Sun of Justice, Christ our God, making the cave a heaven and the manger a noble place! May He Who deigned to be born in the cave and rest in a manger take up His abode in us. Let us join our voices with the angelic choirs and glorify God, beseeching Him to bring peace, justice, and reconciliation to our troubled world. View the 2018 Fasting Calendar. The reality is still the same, Christmas has never changed. It is the birth of our Lord, and always will be. When we exchange gifts with one another, the gifts should be an expression of one’s own gratitude, to God first and then to our loved ones. 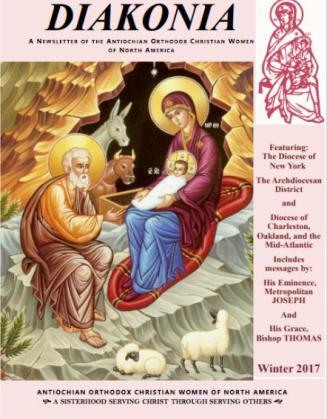 The Winter 2017–2018 issue of DIAKONIA, the newsletter of the Antiochian Orthodox Christian Women of North America, is now available online. This issue features the Diocese of New York, and the Diocese of Oakland, Charleston, and the Mid-Atlantic, and includes special messages from His Eminence Metropolitan JOSEPH and His Grace Bishop THOMAS. ُ المسیح ُ وِلد!َ فمجدوه! As a part of the "Faith Stories" series in the Living Orthodoxy podcast, His Grace Bishop Thomas (Joseph) of the Diocese of Oakland, Charleston and the Mid-Atlantic was interviewed in a recently posted podcast. Living Orthodoxy strives to provide "an invitation to a deeper life in Christ," and is hosted by St. Philip Orthodox Church in Souderton, PA. The wide-ranging discussion with Bishop Thomas covers a variety of topics, including: a brief recap of his upbringing and background, his collaborative approach to ministry, his reflections on the history of the Antiochian Archdiocese, his observations about parish growth and ministry, and his advice to priests and parishioners. 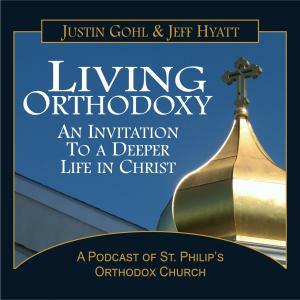 Listen to Living Orthodoxy with Bishop Thomas. 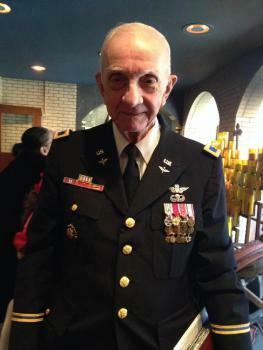 John George Burbules, COL USA (Ret. ), 84, of Sellersburg, Indiana, fell asleep in the Lord on Thursday morning, December 14, 2017 after a brief illness. He had a Christian ending to his life – painless, blameless and peaceful. John’s life was simple. He served his God. He served his country. And he served his family and friends. Each with endless dedication and tremendous love. The rest of his story lives on with the thousands he’s touched. 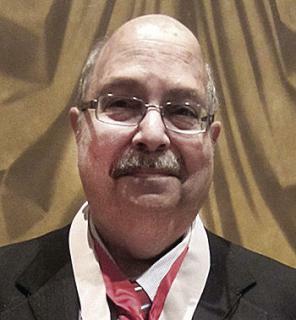 A long-time member of St. Michael the Archangel Orthodox Church in Louisville, Kentucky, he served in various offices on the Parish Council, and – for decades – taught Bible Study and Catechism classes. Those whose lives he touched remember his humility, grace and humor.